The holidays are here again and during a family meeting Dad announces they will all be taking a special trip. He is taking the boys to Tasmania to see the penguins and Mum will take Maddie and Nan to Shark Bay to see the whales. Maddie is a little concerned when Mum says they are taking the ratty caravan, but nothing can spoil her excitement at the possibility of seeing whales. Maddie loves to sing and her favourite music is whale songs. She is super excited! 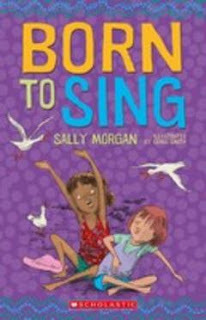 Born To Sing tells the story of the adventure Maddie has with her Mum and Nan as they make their ten-hour journey. It also shares the fun they have when they arrive, including an encounter with the huge and magnificent whales in Shark Bay. A humorous and happy story, it is based around an indigenous family with a lovely bond and is set firmly in the Australian landscape and culture. Where else would you see an emu walking down the main street with no-one batting an eye? Informative and entertaining, this is a great book for those just starting to extend their reading skills to chapter books. It is well written with easy to read sentences for younger readers. Lovely black and white illustrations break up the short chapters, filling the pages and enhancing the light, fun atmosphere of the story.